Billy - On the song White Girl when the vocals start and you switch from the intro riff to full chords... is that a D#aug between the G and A? Whatever it is I really like the way you just barely play it with a slight drag (not sure what the real term for that is). I find myself wanting to over-strum it... which completely ruins the dynamic. It's funny to me that I need to practice NOT playing something. The empty spaces are important. G Aug, B Aug and D# Aug (or Eb Aug) are all the same chord on guitar ... the bass note or resolution determines which it is. Diminished 7th chords work like that too --- B dim7, D dim7, F dim7 and G# or Ab dim7 are interchangeable. Parabar - Thank you for explaining that. I see what you are saying... it's like triad inversions? Same notes, just stacked in a different order? The lowest note is the "root" and determines the name of the chord? Speaking of X songs,,Has X ever come out with a guitar Tab Book ? No. Billy doesn’t read tab so I don’t think he can right a tab chart out either! Seriously I don’t think so and would not be X to put it out. I think the publishing company would decide to put it out or not. Then X would get royalties from the sales. I think it works that way. The Actual Artist/Guitarist of the Band doesnt write out the Tab for any of the Song Books published,they merely give it the Stamp of Approval to its accuracy. If they even have THAT much involvement. I'm sure we've all seen our share of tab books over the years that were not even close to what's actually being played on the record. They have gotten better than they used to be (in my opinion). When I first started playing (1978) I would occasionally look at a tab book at the store, memorize a section and then run back home to try it out only to be really disappointed. Some books were better than others but I'm pretty sure many (if not most) of them were released without the guitar player(s) input. I'm actually glad those tab books back then were so lousy (most of them at least) as I didn't waste my money on them and more importantly it forced me to sit in my room next to my turntable trying over and over to find the right notes/chords. I'm no expert but I think I developed at least a decent ear. I know people a lot better at it than me and I do go to them for help but that keeps it fun... working on stuff together. I was told this many years ago and like most advice I ignored it... but now I "get it" and it's so true... it's all about phrasing. That is what can make a series of notes sound so cool. If the guitar is playing solo, mostly yes. In a group situation, if the bass plays a G, for example, the chord will be heard as a G Aug regardless of what inversion is played on guitar. But the harmonic resolution and function can alter that as well. Augmented chords are usually passing in function, with the raised 5th leading to the next chord. For example, the progression G Major, G Aug, E minor/G is fairly typical. Even with a G in the bass, the second chord could be heard as a B Aug, since B is the dominant in the key of E, and the resolution to E minor could justify that interpretaion. I concur, some Tab Books have left me scratching my head as to how it could possibly be so far off the original song. Either way i like to pick up a book and they will usually get me in the ball park of the song in no time. Laziness and simplicity have caught up with my age. Ive been a huge fan of X since the early 80's and out of respect for Billy's playing and his great songs I felt it best not to butcher up Perfection. Now, I kinnda enjoy a little butchering now and than. I did a cover of a Cover to this X song. (this is Sublime's Version) I grabbed the Tabs off Ultimate Guitar Tabs . Very interesting stuff and I'm slightly embarrassed to have been playing guitar for so many years yet never bothered to learn this stuff. But, here we are and it's fun for me to learn it now. So, if I'm playing the chord below (which by itself I see as Eb aug) but the bass player hits a G note at the same time... my chord would then be considered a G aug? Then again, if the third chord is Em then the second chord would be seen as a B aug because the Em resolves the progression and B is the dominant note of E? Regardless of which note the bass plays? G, G aug, A. All barred, 3rd fret, 3rd fret , 5th fret. Don't make it so hard. Bar a G major, and then raise the 5th with your bad driver finger. It just follows the notes in the intro. Ah ha... I've got it now. Thank you for that explanation. I really like that sound. Now I just have to work on not over strumming the aug chord. White Girl is such a good song. I remember hearing it for the first time during the heyday of the Vancouver punk scene..... ....I have always been curious if the studio track was recorded with the DuoJet,or a Strat.....or something else....?? Silver Jet, Strat, 6120, Rickenbacker 12 string....maybe a couple of others. I don't remember how many tracks of guitar, all playing the same thing. It's a really cool transition from G to A. 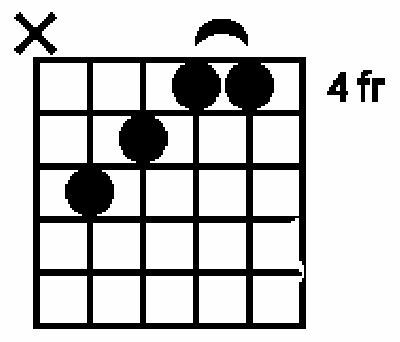 The G chord 5th is D. The G aug 5th is D#/Eb. The A chord 5th is E. Semitone shifts to get there. I like this a lot. It's the notes of the guitar intro. Nothing else would fit. Don't overthink. I swear I'm not trying to overthink it but I can't stop wondering... do you lift your third finger off the D note on the A string? If you're moving your middle finger down to the B string to raise that D note to a D# (making it a G Aug), it seems you would NOT want to leave the D note on the A string. Do you lift your third finger and use your first finger to mute the A string? Billy--- I have also always been curious: Did Ray Manzarek have a lot of input on the songs,or did he he just let you and the band run with it? Thought this was gonna be a thread about Joni Mitchell's weird tunings. Ray made the lines of cocaine, and said.."It's sounding really good, try it one more time"